Ensure Privacy > Enabled is checked. 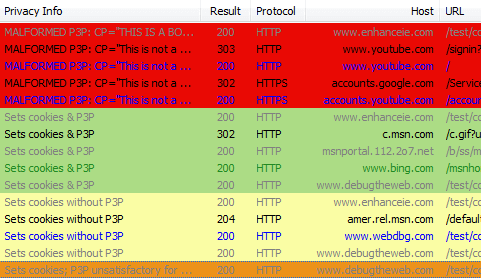 The add-on will add a Privacy Info column to the session list and will flag HTTP/HTTPS responses which set cookies. Green sessions send a satisfactory P3P policy. Yellow sessions set a cookie without a P3P policy. Orange sessions send a P3P policy that does not permit use of the cookie in a 3rd party context. Red sessions send invalid P3P policies.